Will Jeep finally sell a pickup?! I mean, no... but I'm still looking forward to the seven special Jeep prototypes we'll see at the 2015 Moab Easter Jeep Safari in two weeks, especially this vaguely Chevy Avalanchey Wrangler rendition. Easter Jeep Safari is probably the biggest annual gathering of Jeep nerds in the world. The company trots out some fun Mopar-made custom rigs and hundreds of independent shops bring even cooler iron to the slickrock trails of Moab, Utah. 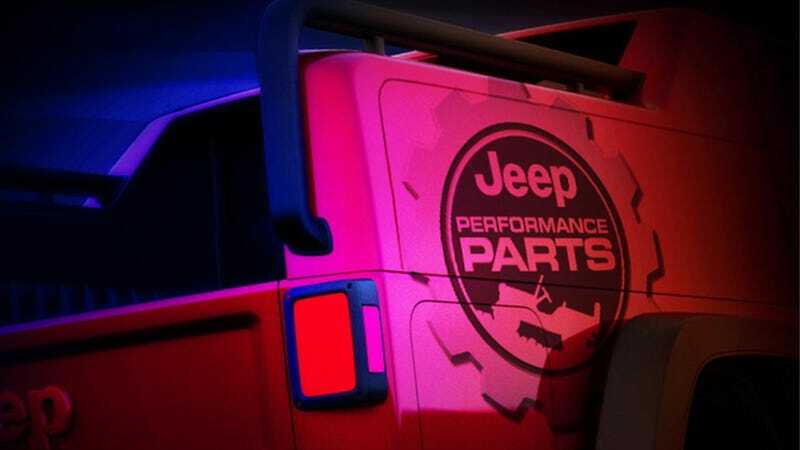 We'll be there driving a few, until then we've only got these two teasers; the "Wrangler Red Rock Responder" pictured above with a flying-buttress'd pickup bed and the Jeep Chief, which looks like some kind of retro-styled off-roader. I like what I'm seeing so far!